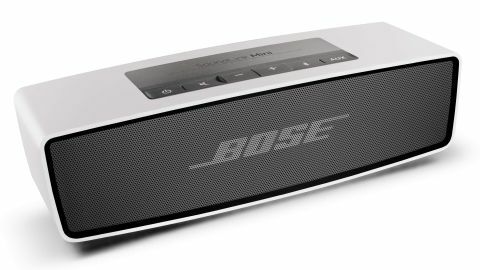 Following on the success of last year's SoundLink Bluetooth Mobile Speaker II, Bose did the next logical thing. Go small. Coming in at a svelte 1.5 pounds, the SoundLink Mini, while diminutive, manages to belt out some of the best sounding audio we've ever heard from a device this size. From a design perspective there's not much we didn't like about the SoundLink Mini. Made entirely of brushed aluminum the diminutive speaker manages to straddle the fence between retro and modern. While other manufacturers are opting for crazy colors the SoundLink Mini would look cool in pretty much any environment. Additionally, being made almost entirely of aluminum the SoundLink Mini feels relatively heavy. While "heavy" is usually something we eschew in a portable device, in the case of the SoundLink Mini it makes the speaker feel nice and solid. We easily paired the SoundLink Mini to several devices including an HTC One, Samsung Ativ S, an iPhone 5 and the Nokia Lumia 1020. The SoundLink Mini is designed to remember connections to up to six devices, so once we paired a device, we had no problem making a connection later. The controls on the SoundLink Mini are super simple. The controls are all on the top and are rubberized. There you'll find the volume up and down buttons, the power button as well as the mute button and two more for Bluetooth and an auxiliary button for use with devices that don't boast Bluetooth support. According to Bose, the speaker boasts a range of about 30 feet as well an auxiliary port that lets you connect non-Bluetooth devices. In our tests we were able to maintain a connection to the speaker when we left the audio source in a house and walked outside. Of course, the downside to this is that you won't be able to control the music. So while this "works" we don't really see the point. We played a variety of music and everything from R&B and hip hop, replete with all of the deep bass that you'd expect, to acoustic music from the likes of Ray LaMontagne and Damien Rice, all sounded crisp and clear. Kudos aside however, when it comes to audio performance you can never really get past simple physics. While the SoundLink Mini is able to get plenty loud the fact remains that while the mids and highs were excellent, achieving truly amazing bass requires that you move a lot of air, and while Bose has done a good job of that considering the size of the device, it can't compete with larger speakers. The SoundLink Mini sports a rechargeable lithium-ion battery and, according to Bose, users can expect up to seven of hours of continuous play. In our tests we had no problem achieving this kind of battery life. Bose offers two charging methods with the SoundLink Mini. There's a stylish charging cradle that's great for when you're at home. If you're on the go, a wall charger that plugs into the charging cradle can also plug into the speaker itself. The thing is, the current trend with truly portable Bluetooth speakers is their ability to be charged via a MicroUSB port. The great thing about this is that nearly every phone, save the iPhone, uses MicroUSB so in the case of the SoundLink Mini you'll have yet another charging solution to carry around. On the plus side the SoundLink Mini can be fully charged in around three hours. With the SoundLink Mini, Bose created a very stylish piece of gear. The guts are encased in a single piece of aluminum and while this looks and feels great, we worry about scratches. To that end, Bose is offering a plethora of protection options for the SoundLink Mini including a variety of soft covers that come in several covers as well as a nifty carrying case. Expect to pay around $25 for the soft covers and $45 for the carrying case. Boasting excellent sound quality and a beautiful design, there wasn't much we didn't like about the SoundLink Mini. Add to that Bose pedigree, seven solid hours of music playback and anyone who picks this speaker up will no doubt be pleased with their purchase. There isn't much to dislike about the SoundLink Mini. Its major drawback is its size. Because of how small it is, don't expect the kind of bass response you would from a larger speaker. That said, it's still far superior to the Beats Pill or even the BoomBot Rex we reviewed earlier. Additionally, the brushed aluminum while great to look at is susceptible to scratches and scrapes. We highly recommended dropping an extra $25 for one of the soft cases.